Kuli-kuli is a West African food that is primarily made from peanuts. 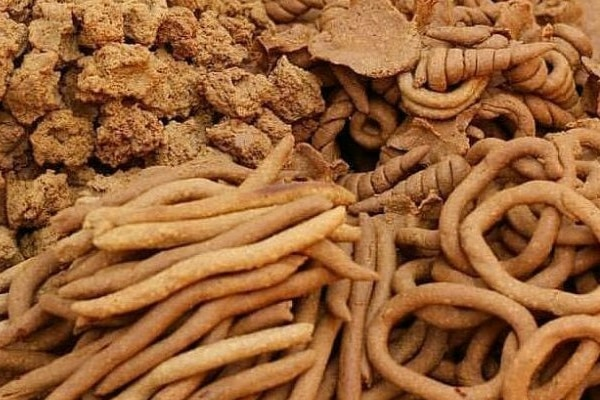 It is a popular snack in Nigeria, Benin , northern Cameroon and Ghana . It is often eaten alone or with a mixture of garri , sugar and water popularly called "garri soakings". It is also eaten with koko, fura, kamu; and is sometimes ground and put into salad . It is often ground as used as an ingredient for Suya and Kilishi. To make Kuli-kuli, peanuts are roasted and then ground into a paste called "Labu". The paste is then mixed with spices , salt, and sometimes ground pepper . The paste is stripped of excess oil with water, and made into the desired shape (round balls, cylinders, etc.). The oil removed in this process is then heated and used to fry the shaped peanut paste until it solidifies. It is then removed from the oil and allowed to cool down until ready to be eaten.